Video games first became a hobby of mine on Christmas morning, 1987, when my father bought me a Nintendo Entertainment System and the games Super Mario Bros. and Rad Racer. The latter, originally released in Japan as Highway Racer, had graphics so realistic for their time it sent my father running out of the den shouting to my mother, “Trish, you have to come see this, the cars look like real cars!”. For an 8 year old kid who never had his own console, Rad Racer most certainly lived up to its name and I played it most every day after school for the next three years. When Horizon Chase Turbo, a retro racer inspired by 80s racing games, hit my review queue late last month, it instantly gave me Rad Racer vibes. After sinking about 20 hours into the game, that impression still holds up, for better and worse. Horizon’s primary game mode is World Tour, sending you across the globe from California to Brazil, South Africa and more, and as such probably has more in common with the original Outrun than anything else. Each location has 3-4 locations, and each location has 2-3 races. Every race earns points that can be used to unlock cars and new racing circuits, and each location has an Upgrade Race that can be entered once enough points have been earned. Placing first in these races will allow you to select one of three upgrades that are then automatically applied to all your cars (there are about in total). Most of these cars are thinly disguised copies of real world sports cars like the Ferrari F355 Berlinetta, Dodge Viper and BMW M3, only with different names, each with mildly different statistics that change their acceleration, boost and handling. Ultimately the differences are small and mostly meaningless, and the right car for you will be the one you think looks the coolest, which is how arcade racers should be, anyway. Tracks in Horizon are fairly typical circuit races ranging from 3-7 laps each, none (in World Tour) taking more than 3 minutes to complete. During each race you will need to grab fuel pickups scattered along the course to ensure that your vehicle does not run out of gas, and optional tokens which simply accelerate the speed at which you unlock new locations and cars. You start with a supply of three nitrous boosts that can be engaged at any time, with the occasional option to pick up more off the track during your race. You rarely get a chance to use these until later in races, though, as each track starts you at the back of the pack in a field of 20 cars, making much of any race’s first lap more like bumper cars than anything else, and the hit detection and physics of those bumps and grinds can be incredibly frustrating. Even tapping a car in front of you will bring you to a near standstill, while the victim of your attack shoots off over the horizon or around a corner, likely never to be seen again. It’s enough of a problem that I eventually fell into the habit of restarting any race where I hit more than two cars on the first lap, because you simply do not have enough time to recover from them, which is made all the more annoying by the fact that they’re often not your fault to begin with. The poor racing AI also ensures that the last laps of any race play out almost exactly the same every time, with you eventually breezing up to 3rd place and then being required to lap several of the lagging cars before you even have a shot at first or second. It’s certainly possible to have a nearly perfect race and still lose simply because the AI never even gives you a shot. In this way the game most certainly feels like the retro racers that inspired it, but that’s not always a good thing, especially when talking about an era where almost all games were riddled with cheap AI or difficulty to mask how incredibly short they actually were. While I appreciate the dedication to the decade it’s emulating, I wish Acquiris had stuck with simply emulating the look and feel of it. On that front, Horizon is a wonderful throwback that really does a fantastic job of evoking nostalgia for classic arcade racers. The game makes great use of the foundations upon which Outrun and Rad Racer were built, offering a retro look that is also clean, vibrant and genuinely pleasant to look at, and the 80s synth soundtrack is, as the kids say, on point. 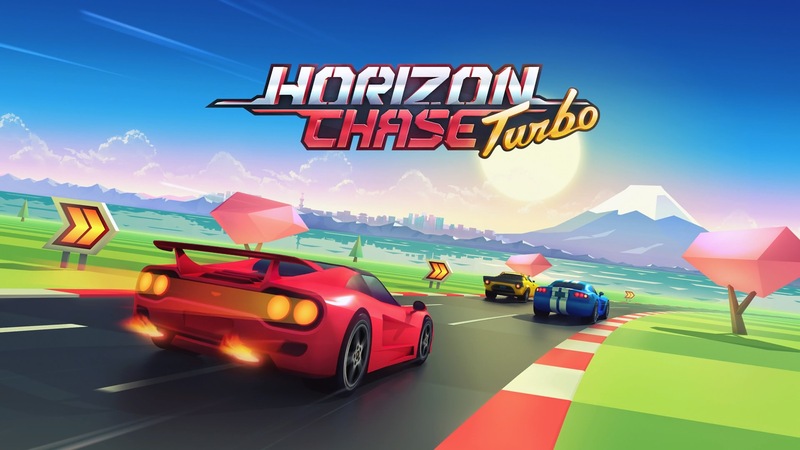 It’s got some rough edges, and I really wish it had a solid online multiplayer component, but ultimately I like Horizon Chase Turbo; probably more than I should. It is first and foremost a nostalgia machine, one designed to take players my age back to the days when Friday nights were all about hanging out in your PJs, playing Nintendo and pounding soda until the wee hours of 10pm, and to its credit Horzion Chase Turbo does that excellently. It’s not going to replace games like Gran Turismo or Burnout Paradise as your go-to racer, but I can definitely see myself hopping on and playing for 30 minutes at a time for years to come.